Preparing for the Christmas holidays in the Mennonite colonies in Mexico is similar to preparing for a wedding as described in this post. Starting around mid-November, the whole yard gets wrecked, and the bottom ten inches of the trees get painted white all around the property. At the beginning of November, children start memorizing the Christmas wensch (short poem wish) and some songs at the Mennonite school. On the last Friday before Christmas, parents go and listen to the children say their wensch and sing songs at school. On this day, the children bring the teacher a gift, wrapped in newspaper. During my Mennonite school years, the most popular items to bring a teacher were grocery items such as cornflakes, instant coffee, sugar, and soap. In early December, women would often make new curtains, always wash the walls and do a major cleaning in every room of the house with pine sol water. Some Mennonites who could afford to buy decorations would decorate their house by hanging plain Christmas ornaments and tinsel on the walls. Others put string wall to wall and hung all the Christmas cards over the string that they had received and collected over the years from family members in Canada and the United States. We don’t put up a Christmas tree, not because we don’t believe in having a Christmas tree, but because it isn't a big deal. Most people can’t afford to buy a fake one, and to kill a living tree for that reason, has never crossed our minds. It was hard enough to keep the few trees that we had alive due to the lack of rain and shortage of water. I believe it is because of that that the Christmas tree has never had a chance to become a tradition in my lifetime. Even for us Low German Mennonites living in Canada, it's not that we are against or for putting up a Christmas tree. It just has never been a big deal to us. The Mennonites that could afford it would often team up and go Christmas shopping in Mazatlan, Sinaloa on a tour bus. They would be gone for three days or more because it took about eight hours to drive through la sierra madre to Mazatlan. They shopped for household items and items such as tools, baby dolls, toy dishes, crayons, toy tractors, sweets, and peanuts. 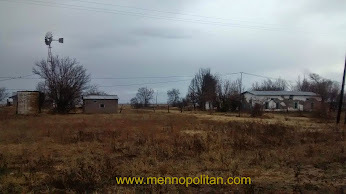 Others would shop in Nuevo Ideal and in the Mennonite stores in the colonies. Most kids got to go to Nuevo Ideal on Christmas Eve with their parents after the chores were done. The children would get a bit of money to buy treats for themselves and families would eat at a taco stand or sometimes even in a restaurant. I remember the police officers standing in the middle of the streets of Nuevo Ideal directing traffic so we didn’t get run over by a massive number of vehicles that were visiting Nuevo Ideal from the US and Canada. They were also trying to park to do their shopping. Some of the older youth would be allowed to take a bus to Durango city for a day to do some Christmas shopping as a group without the parents. I got to do this once, and it was the most exciting thing I experienced before I came to Canada, especially the two-hour bus ride through the most beautiful mountains. I remember it like it was yesterday. I remember the song that was playing in the background by Marco Antonio Solis and Maricela while I walked down the aisle in the Soriana looking for the perfect bottle of perfume in my price range. Every Christmas Eve just before the children go to sleep, they will each place a washing up bowl at their respective spot at the dinner table. After the children are in bed, the parents will proceed to put unwrapped presents inside the bowls to be discovered by the children in the morning. Christmas morning (December 25) my brother Johan and I would make a fire in the wood fireplace before the rest of the siblings got up. We waited for everyone to get up before we looked in our bowls. We would find things such as peanuts, oranges, a few candy bars, store bought cookies, socks, fabric for a dress or overalls, crayons a coloring books, and depending on the family sometimes a toy in our bowls. The older kids would get a song book or a catechism. Christmas day a few of us would go to a morning church service to honour the birth of Christ, and then spend the day with family at our grandparents’ house. After everyone had lunch, and the dishes were done, all the school-aged children would take turns in order from youngest to oldest and say their wensch in front of the parents and grandparents. Each child received a treat bag after they finish saying their wensch. After the children all finish saying their wensch, they go out with their treat bags to play and then the adults receive gifts such as household items, tools, fabric for overalls and dresses. On the mid-holiday, we would do the same with the other grandparents. On the third holiday, people would often go to the mountains and have a BBQ with friends and family while the ministers had their family gatherings.